The Wireless LAN certified administration (WLAN-CAD) training is the basis of the WLAN-CTP program. A broad spectrum of Wireless network topics based on the 802.11 (a/b/g), 802.11e and 802.11n standard is presented. Thus it is possible to introduce the IT professional who have little experience to Wireless networks. For the experienced IT professional this training closes the knowledge gaps and prepares them for the certification. The participants learn how to administer, install, configure and troubleshoot a Wireless network system. 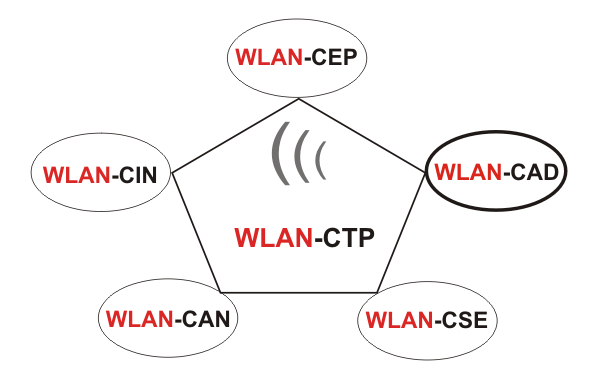 By receiving the Wireless LAN certified administration (WLAN-CAD) certificate the first step concerning the WLAN-CEP certification is obtained. Network experts and administrators attest, that they possess the needed ability for an administrator to install, configure and troubleshoot a Wireless network system. The Wireless certification is a excellent addition to the existing network know-how and certifications. Should a certified employee start a new job in a new company, who use other equipment than the old company, the knowledge received with the old company still stays valid and is applicable. Should a company test hardware of various vendors, the knowledge and abilities of a certified employee are very important. Should a company test new hardware of a new vendor in order to substitute the existent hardware, the knowledge of certified employees are increasinly valuable. Immediate recognition as an employee on the go, who is on the path of a fast growing technology. The certificate assures furthermore mobility of the industry, also for the comming years.